Our special purpose Aluminum ducts are made from corrugated aluminum which have water-tight lock seams. ATCO #017 and #018 are UL listed, whereas ATCO #020 does not have a UL listing. Our special purpose NEW ULTRA-FLEX Duct kit provides an easy, economical method for protecting a flexible duct from damaging ultraviolet radiation emitted by UV bio-treatment lamps. Each kit contains a 10' piece of UL 181 Listed ULTRA-FLEX duct, with a 4" long metal connecting sleeve. 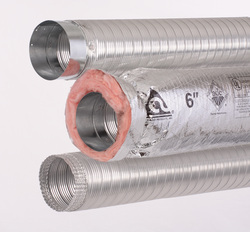 Atco Ultra Flex - R6 Insulated flexible duct kit with UV resistant inner core.